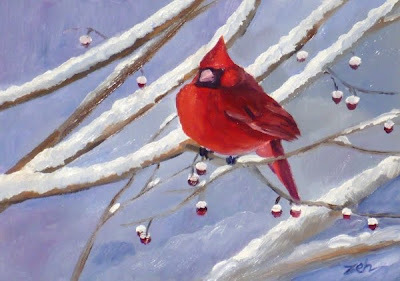 A bright red cardinal fluffs up his feathers against the cold. He is sitting in my crabapple tree which has far fewer berries after the migrating birds came through this fall. But there are still enough that if this fellow wants some, they are there, dried up, frozen and all! This painting has been sold. See more of my art at zehoriginalart.com. Thanks and have a great day!